Inder Loves Folk Art: A tour of my sewing corner. 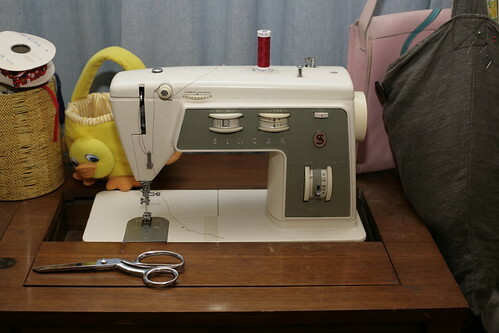 If you follow sewing blogs, then you have seen the posts where seamstresses (and seamsters) show off their beautiful "sewing studios," which are usually spacious, tidy, and decorated with gorgeous hand-sewn projects. I love to see other seamstress' work spaces, but I admit, these images are often a bit intimidating and jealousy-provoking. So, as an antidote to the many beautiful sewing spaces you'll see on the blogosphere, I figured I would share some photos of my sewing space. It is neither jealousy-provoking nor intimidating! It is also neither spacious nor tidy. It's decorated with heaps of fabric, scraps, and unfinished projects. It is in the corner of my dining room, which is in the middle of my house, so the untidiness is generally on display, for all to see. I prefer the term "hard-working" to "messy," thank you very much. Not the most obvious use for a china cabinet, but it works! Here's the crazy part: I like it. I like doing my sewing right in the middle of the living space, where I can keep an eye on Joe, play music, chit-chat with my husband, and watch television out of the corner of my eye. This is perfect for me: I grew up in a house full of activity and kids, and I've always thought peace and quiet was overrated. I like bustle. I've had a variety of sewing spaces in my life, and here the thing: When my sewing materials are hidden away out of view, whether in a closet or a back room, I don't sew. I've sewn more since creating this sewing corner than in the prior ten years combined. It works for me. 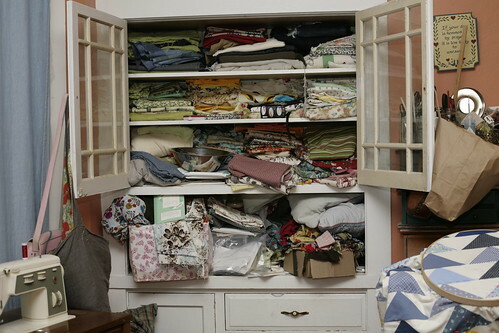 I store my fabric in an awesome built-in china cabinet, whereas my china is hidden away in a cupboard in the kitchen. Priorities! (Also, earthquakes!) I didn't straighten it up one bit for this photo - sometimes my piles are neater, but not often. (This isn't everything - there is more fabric and batting stored haphazardly in our back room.) When I do organize it, I stack quilting cottons by color, and everything else by texture and fiber content. And then I get inspired to do something and mess it all up again. The boxes in the hutch hold larger pieces and my prodigious scrap collection (gotta do something with those scraps ...). There are notions, thread, and patterns in the drawers and cupboard. My ironing board sits to the right of the fabric stash. It is often piled up with tools and works in progress too. Steve dumps his keys and wallet there on a regular basis. A few hours later, they are often deeply buried under whatever I'm working on, leading to daily conversations regarding their location ("I think they're under the green shorts, honey!"). What is that heaped on top of my ironing board to the right? Good question! Here's a close-up. 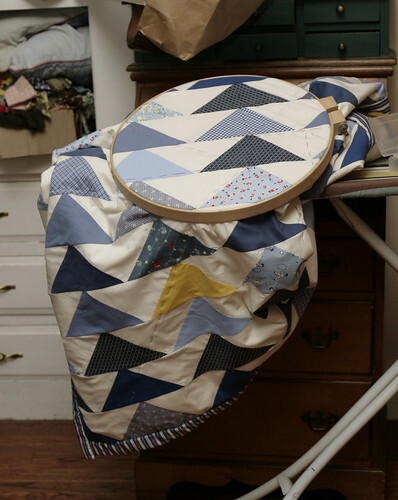 "Flock of Triangles" for Joe, piled on the ever-precarious ironing board. Remember when I cut this out, last December? It's a quilt for Joe. The boy needs a mama-made quilt. After leaving it untouched for months, I finally got around to sandwiching it and basting it yesterday, so I can finally begin (hand) quilting it. Insisting on hand-quilting your quilts is one of the Seven Habits of the (In)Effective Quilter, of course. My hope for this one is that it will not take me thirteen years to complete. In fact, I am aiming to complete it in the next few months. I'm not sure if sharing this goal with my blog audience will motivate me to work hard on it or activate my quilting-commitment-phobia and send me running to sew more shorts. We'll see! Here is my sewing machine. My one-and-only. I don't have a serger or anything "fancy" like that, although I sometimes wish I did. I do everything on my trusty mid-1970s Singer Stylist. Some of my trims are in the bins to the left. I have no idea where that cheesy duck basket came from, but it holds elastic. It is older than me, but I've had it for fifteen years now. I bought it at an estate sale in 1996. It came with the table, a full set of presser feet (but no walking foot - I've never tried to machine quilt), and the original manual (which I have since lost, luckily you can download them on the Singer website). It was exquisitely well-maintained by its former owner, a grandmother who proverbially "only drove it to church on Sundays." I think I paid $90, which was a lot of money for me at the time. Since then, it has not been as well-taken-of, but like an old VW, it is mechanically simple, completely manual, mostly metal, and easily fixed. Unlike an old VW, it rarely breaks and it doesn't leak oil. I've had it tuned up exactly once (which also cost me $90, bringing the amortized cost of this machine up to $13 per year). Steve recently fixed the bobbin winder with a $0.99 part and a piece of masking tape (so make that $13.01), which I expect to last at least 15 years. I'll never be able to upgrade to a "better" machine, because this one will NEVER, EVER DIE. It was built when the concept of "planned obsolescence" was still just a sparkle in the eye of a Stanford drop-out. It does not make the most beautiful buttonholes, but it gets the job done. It's a good little space and a great little machine. Now, back to work! How refreshing! I also sew i the middle of the action in our house, and my 'stuff' is always out and looking cluttery. You know that sewing machine would almost certainly take an old Singer buttonholer, if you can drop the feed dogs or if it has a little screw hole in the base where you can attach the feed dog cover which comes with the buttonholer. I highly recommend! Love old Singers. Yes! I want a vintage buttonholer! And maybe a walking foot too! :-) I love the old Singers, they are indestructible! I know, I've been trying to destroy this one for fifteen years, no dice! I'm so glad to see I'm not the only one who makes a big sewing mess in the middle of the house and likes it that way. People often ask me how I find time to sew. I realize, the location of my sewing station is KEY. I find the time to sew by taking a minute here or there to do something, while also talking with my toddler, or catching up with my husband. That's HOW IT'S DONE, folks. Hi There, I think we have the same or similar Singer machine and cabinet....well, I chucked the machine and kept the cabinet. Im writing a post on how I use and transformed the cabinet. You will hardly believe how beautiful it looks! Id love to see a pic of your cabinet and if its a good shot I could add it to my post. Email me if you are interested: nberryid at gmail dot com.